Leni-Bongbong Undervotes Case: How can one COC has 623,174 less VP Votes than the Presidential Votes? Large undervotes for Vice President in questionable COCs were disclosed amounting to more than half a million difference between Presidential and VP Votes. 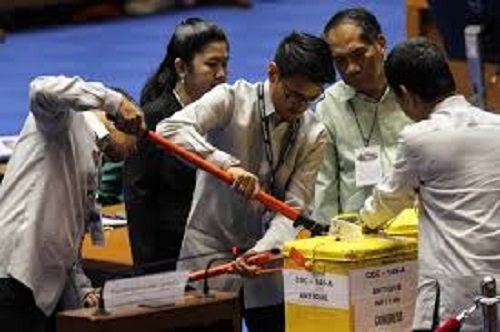 The very first day of the official canvass by the Board had noted large amount of undervotes in the vice presidential – that is more than half a million votes behind the Presidential Votes. This is clearly electronically maneuvered discrepancy. The huge gaps were noted by Atty. George Garcia, Marcos’ lawyer that from the Certificates of Canvass that has been counted so far. In many instances, votes for president outnumbered the votes for vice president by 623,174 as reflected in various COCs. Leni Robredo did not have a clue that only !% undervotes is acceptable in Philippine elections which should not exceed 400,000 each COC for those particular cases as she defended her side saying; it’s normal during elections to have undervotes – when in fact, this must not be permitted during close fight such as this one.